In March, Baylor University received a Silver designation through the Sustainability Tracking, Assessment & Rating System (STARS), a transparent, self-reporting framework for colleges and universities to measure their sustainability performance through the Association for the Advancement of Sustainability in Higher Education (AASHE). Baylor received a Bronze designation in 2014. "Attaining a silver rating on the AASHE STARS assessment is a great achievement for Baylor. Since 2007 our sustainability efforts have been consistently growing and this accomplishment is another important step forward for our program," said Pattie Orr, vice president for information technology and dean of University Libraries. She leads the Baylor University Sustainability Committee. "These assessments help us compare Baylor to other institutions and also set the horizon for our next level of achievement." 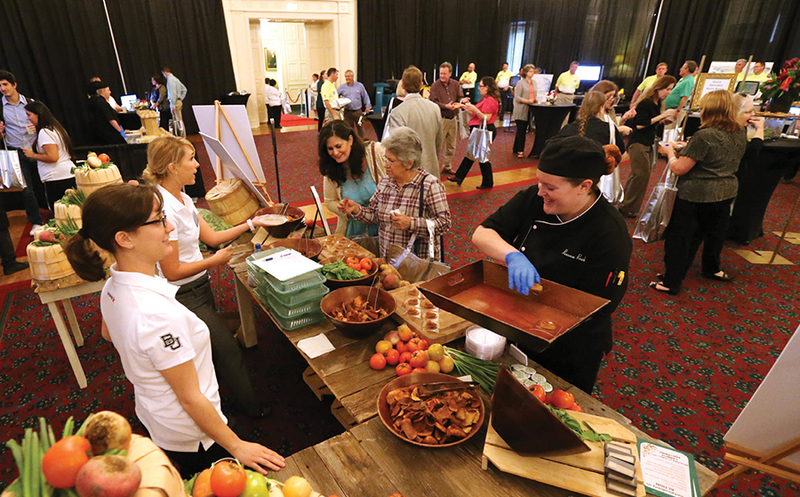 "With STARS we review our operations, from housekeeping to curriculum to financial aid, and so on, in an absolutely exhaustive way, once every three years," said Smith Getterman, assistant director of sustainability and special projects at Baylor. "This review process helps us measure success and identify areas for improvement. At the same time it gives us a chance to show other universities around the world what Baylor is doing and how seriously we take these issues." Getterman says that sustainability now "permeates campus" and includes efforts like the university garden, Energy Awareness Program and residence hall energy reduction competition, increased organics and locally grown food in dining halls, LEED certified buildings, continued improvement of campus irrigation system, increased integration into all athletics programs and facilities, and the recycling program. "Thanks to initiatives like our Move In recycling and Move Out donation drive (Give & Go), increasing numbers of employees recycling at their desks or in their offices, and the expansion of our campus recycling program to include more bin placements and new outdoor recycling bins, we crossed the 1 million pounds recycled barrier for the first time in 2014," he says. The Sustainable 2020 goals are part of a five-year plan that includes increasing locally sourced food in dining halls by 20 percent, diverting 30 percent of campus waste from the landfill, reducing greenhouse gas emissions by 15 percent, and reducing water use by 17 percent. "This is the first time the University has set any emissions- or water-related goals. We are at a critical time in history where we as a Christian university firmly believe that we can no longer stand idly by without acknowledging the need to pay more attention to our campus emissions and their impact on our surrounding environment," Getterman said. "As a university in a state that experiences drought, it's vital for us to take an active role in managing our water consumption." "The goals recently established by our University Sustainability Committee will enable Baylor to continue to make our community more sustainable," Orr said.